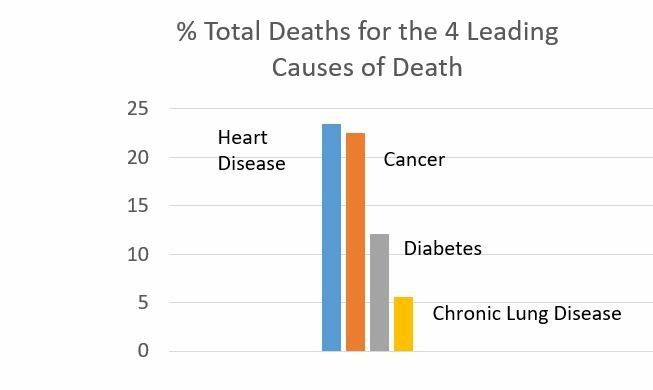 Amongst all chronic diseases, complications of diabetes cause the longest duration of disability and dementia, the second most expensive annual cost for treatment and, directly and indirectly, the third most common cause of death in the USA. If you have Overweight Diabetes, rising costs for medical care make it likely that your out-of-pocket expenses will be a least $5,000/year more for you than for everybody else who is just like you except you have diabetes. 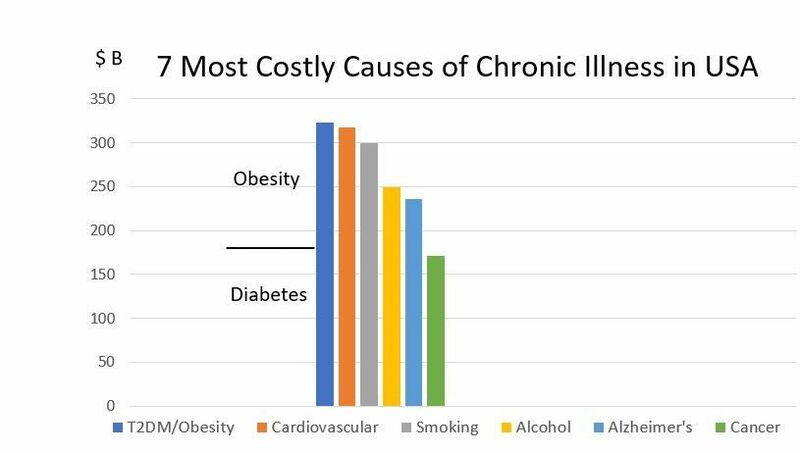 Diabetes and its association with obesity is the most expensive cause of chronic illness and disability in the USA. Grouped together, both are caused by eating too much and too little exercise. Both also contribute to cost as major causes of cardiovascular disease and cancer. Chronic illness accounts for 86% of all healthcare spending which takes more than 17% of GDP and more than $10,000 per person every year. Too many calories taken in and too few used for energy can be corrected and would save more than 10% of total healthcare costs in the USA. Health Skills to Escape Diabetes! It takes skill to eat less and exercise more than most of the people around you. That’s the way to escape the overweight inactive diabetes epidemic. Good health requires controlling chronic medical illnesses by what we do for ourselves and our families. Each of us can enhance quality as well as length of life. We can't buy good health, we have to learn the skill and earn the benefit by rational action. We can train you to improve your health skill. This overweight diabetes epidemic is increasing in severity and spreading nationally at an alarming rate. Consuming more calories and doing less exercise spreads by popular example and advertising. Increasing? Where and How Much? Thank you to all of the new people who continue to come to TeleMedVIP to work with one of the physicians or participate in the Wellness services. We continue to refine the website to hopefully make it easier to navigate and answer questions. We have some exciting things in the pipeline, one of them being a program to address Type II Diabetes coming online shortly. Dr. Herd will be contributing a series of blogs around this topic too. If you follow us on Twitter or Facebook, you have likely seen that the fellow in our logo is called Strandie™. We plan to begin updating the blog on a regular basis very soon. If you wish to email us questions, please send them to info@telemedvip.com.